Has The Mystery Of THAT Tupac And Rihanna Picture Finally Been Solved? Is the picture a fake? The Internet recently went into a frenzy after Tupac was seemingly spotted alive and well alongside Rihanna. The sensational claims quickly spread around the Internet, as many fans debated if Tupac was actually alive or not. However it now appears the photo may actually be a fake. 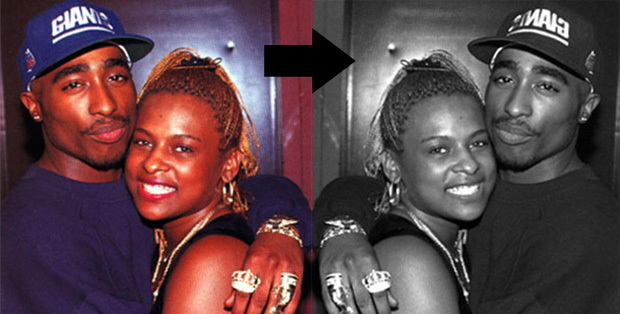 Tricksters could have taken an original image of Tupac (below) alongside rapper Yolanda ‘Yo-Yo’ Whitaker in the 90s. Then flipped the picture the other way around and turned it black and white. And swapped Yo Yo for Rih Rih. Meanwhile, it has been confirmed that picture has been online for around three years – after the Bajan singer initially posted it on social media in 2012. However this hasn’t stopped conspiracy theories over the years, who have claimed that Tupac didn’t die after being shot multiple times in 1996 – but in fact faked his own death.